It is January, which means that one of HRWC’s favorite events, the Stonefly Search, is right around the corner. Stoneflies are interesting because they are the most pollution intolerant group of aquatic insects that we have in Michigan. They can only thrive in the cleanest water with high levels of dissolved oxygen. When they are found at a location it is a confirmation of high water quality, and when they disappear from a stream it is a warning sign that water quality has degraded. It might seem strange to many that we hunt for stoneflies in the winter. This is because two of the stonefly families, the Capniidae and the Taeniopterygidae, change from aquatic nymphs to terrestrial adults in the late winter and early spring. This means that we can’t find them during the normal April River Roundup, and so we have to look for them earlier in the year! The Stonefly Search always produces interesting results. Let’s take a look at some of the findings in recent years. 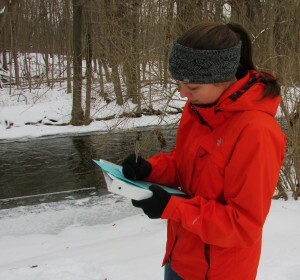 Reported in 2013: Four sites had the best stonefly samples that had ever been seen at those locations: Chilson Creek at Chilson Road, Fleming Creek at Galpin Road, the Huron River at Flat Rock, and Woodruff Creek at Buno Road. At each of these sites, the stoneflies normally found at the location were there, but also new stonefly families were found that had never been seen there before! 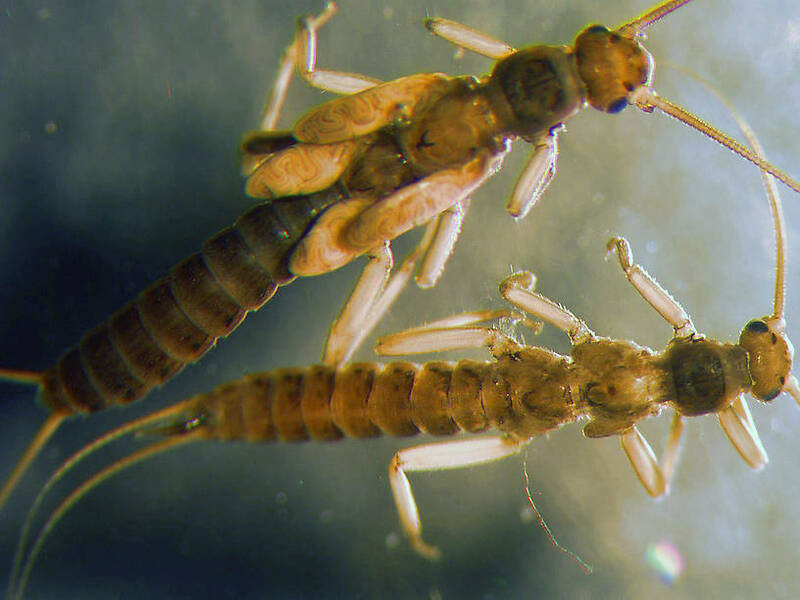 A greater diversity of stoneflies indicates greater stream health. These are promising results and hopefully it will continue into longer term trends. Reported in 2011: Since 2007 and up through last year, our volunteers have found 4 families of stoneflies in Mann Creek. This includes 2 stonefly families that can be found in creeks year round (Perlidae & Perlodidae), and the 2 stonefly families that are only found in the winter (Capniidae & Taeniopterygidae). Even in the Huron’s healthiest streams, it is unusual to find more than 2 families of stoneflies during the Stonefly Search. So, Mann Creek is special indeed. Mann Creek flows through a residential neighborhood- but one really interesting thing about Mann Creek is that there is a very wide natural riparian zone surrounding the creek. This riparian area provides habitat and food for stoneflies as branches and leaves fall into the creek. To see Mann Creek and its impressive riparian zone, click here. Reported in 2015: Davis Creek at Pontiac Trail (near South Lyon) is a location where the stonefly population has dropped over time. This change is concerning because it happened slowly over the last ten years and our spring and fall samples show a very similar pattern. In the early 2000s we regularly found one or two stonefly families at the creek, but they started to drop off and now have not been found since 2009. Reported in 2015: The team searching for stoneflies in Honey Creek at Wagner Road (Ann Arbor) were unable to find stoneflies. This site has been sampled 14 times since 1995, and this is the first time that stoneflies could not be found. This is a site with lots of turbulent highly oxygenated water and should be a great place for stoneflies. Taken in isolation, the absence of the stoneflies at Wagner Road would not be concerning given that this is a single sample. However, two upstream Honey Creek Adopt-a-Stream sites used to have stoneflies but haven’t in years. Stoneflies haven’t been seen in Honey Creek at Jackson Road since 2008; they haven’t been at Honey Creek at Pratt Road since 2003. All of the pieces combined indicates that the overall quality of Honey Creek is degrading over the last decade. Reported in 2013: The team searching for stoneflies in Woods Creek in Belleville came back disappointed. Wood’s Creek at the Lower Huron Metropark has been sampled 12 times since 1997, and this is the first time that stoneflies could not be found. The problem likely comes from the thick ice and difficult conditions rather than pollution or disturbed stream habitat, but we will keep an eye on Wood’s Creek next year. What will we find in 2016? Will Mann Creek continue to reign as the king of Huron River stoneflies? 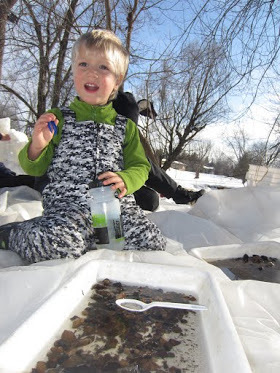 Will we find stoneflies where they have never been before? Will we find stoneflies this year at Davis, Honey, and Woods Creek, or has the water quality there continued to decline? We will see you on January 23 and we will answer these questions together!